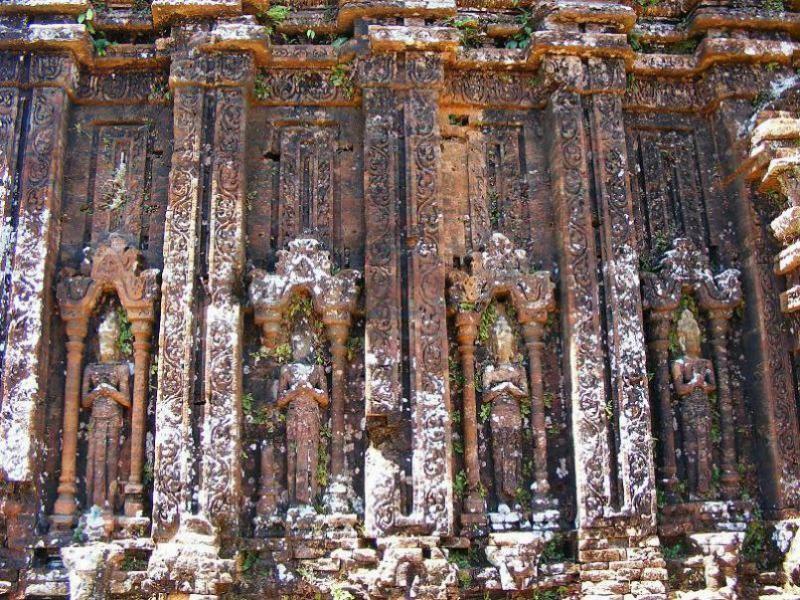 MySon sanctuary is abandoned and partially ruined Hindu Temples (Mainly Siva as Bhadresvara) built between 4th – 13th century by the kings of Champa (Chiêm Thành in Vietnamese). Mỹ Sơn (Kingdom of Cham) is located near the village of Duy Phú, in the administrative district of Duy Xuyên in Quảng Nam Province in Central Vietnam, 69 km southwest of Da Nang, and approximately 10 km from the historic town of Trà Kiệu. The temples are in a valley roughly two kilometres wide that is surrounded by two mountain ranges. Between 4th and 13th centuries there was a unique culture on the coast of contemporary Vietnam, owing its spiritual origins to the Hinduism of India. These huge tower temples were constructed over 10 centuries of continuous development in what was the heart of the ancestral homeland of the ruling Dua Clan which unified the Cham clans and established the kingdom of Champapura (Sanskrit for City of the Cham people) in 192 CE. 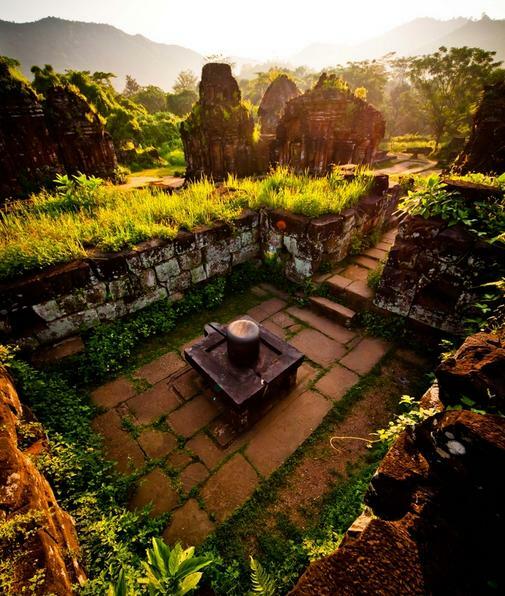 Although Mahayan Buddhism was influential during this period, Saivism survived it in Vietnam. These temples are constructed in fired brick with stone pillars and decorated with sandstone bas-reliefs depicting scenes from Hindu mythology. In the past, about 70 temples of Siva, Krishna, Vishnu etc used to exist here, but now only few remain. Earliest evidence recovered at Mỹ Sơn relate to the era of King Fànhúdá (Chinese: 范胡达; pinyin: Fànhúdá; Vietnamese: Phạm Hồ Đạt, Sanskrit : Bhadravarman, literally “Blessed armour” but also meaning the Jasminum sambac flower), who ruled from 380 until 413 CE. He spent latter part of his reign waging war against the population of Chinese-occupied northern Vietnam. Bhadravarman built a hall containing a lingam to worship Siva under the Sanskrit name Bhadreśvara “Blessed Lord“, a composite created from the king’s own name and the word īśvara “lord” commonly used to refer to Siva. Bhadravarman’s successors heard his plea, for Mỹ Sơn became the religious hub of Champa for many generations. More than two centuries after Bhadravaman’s foundation, the Bhadresvara temple was destroyed by fire. In the 7th century, King Sambhuvarman (Phạm Phạn Chi in Vietnamese, Fan Che as transcribed from the Chinese), who reigned from 577 until 629 CE, rebuilt the temple, reinstalled the god under the name Sambhu-Bhadresvara, and erected a stele to document the event. In 605 CE, Chinese general Liu Fang led an army southwards from the area of what is now northern Vietnam, defeated the elephant-riders of Sambhuvarman, and sacked the Cham capital, making off with an enormous booty that included over one thousand Buddhist books as well as the gold tablets commemorating the reigns of the previous eighteen kings. Heading back north with their heist, the Chinese invaders were struck by an epidemic that felled a large number of them, including Liu Fang. Sambhuvarman, for his part, returned home to his kingdom, began the process of rebuilding, and made sure to send regular shipments of tribute to the Chinese court, in order through appeasement to prevent a recurrence of the recent disaster. 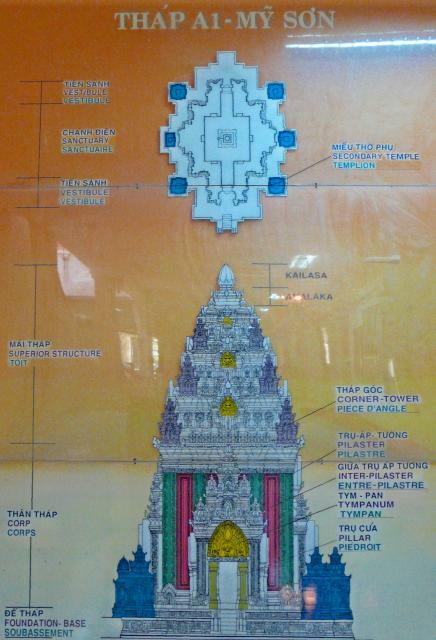 The original temple map was reconstructed by scholars, after bombing destroyed the original edifice during Vietnam War. King Prakasadharma (Po Kia Pho Pa Mo, as transcribed from the Chinese) ruled Champa from 653 AD to 687 CE. Upon corronation, he assumed the name Vikrantavarman and expanded the borders of Champa toward the South. He was dedicated to both Gods Siva and Vishnu, which was unusual for Champa Kings. 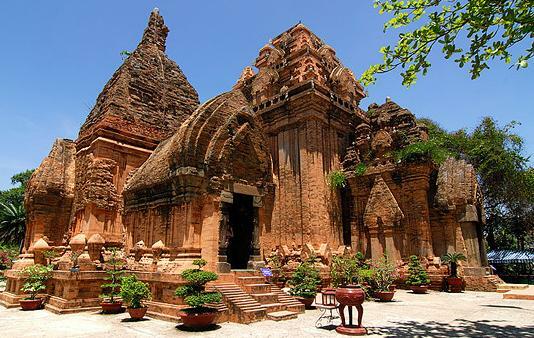 In later years, Mỹ Sơn served as the religious and cultural center of the Cham civilization in central Vietnam, as well as the burial place of kings and religious leaders. People of Champa maintained written records in both Sanskrit and old Cham. They wrote on perishable materials, such as large leaves, and also created inscriptions in stone. They used scripts borrowed from India. None of the writings on perishable materials have survived. However, numerous stone inscriptions have been preserved, transcribed, and translated into modern languages.